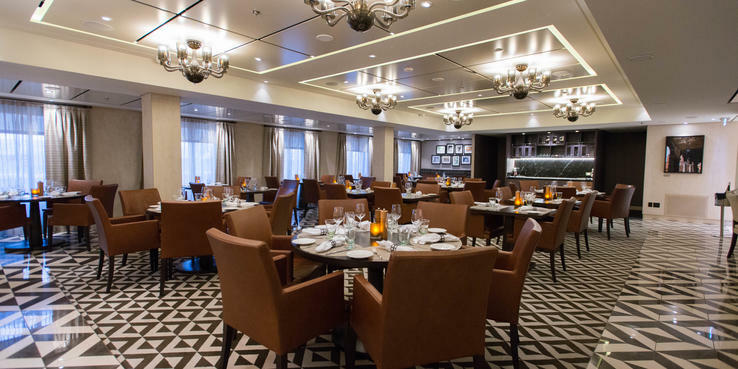 Viking Star offers a handful of solid dining options for any palate. There's no extra fee to dine in any restaurant, save for The Kitchen Table, which is more a dining extravaganza that includes an in-port chef-guided market visit than simply a meal. At lunch and dinner, house-selected red and white wines (and occasionally rose), along with beer and soda, are generously poured at no extra charge. The Restaurant (Deck 2): The ship's primary dining venue, The Restaurant, stretches across the entire aft end of the ship. The open-seating restaurant operates for breakfast (8 a.m. to 9:30 a.m.) and dinner (6 p.m. to 9 p.m.). It has plenty of tables for two (though in many cases they are so close to others that reasonably private conversation is impossible), as well as lots of large tables. You may choose to share a table with others if you'd like to be even more social. What we loved about this restaurant is that its walls are lined with floor-to-ceiling windows that can open up, offering an alfresco ambiance in good weather. On our trip, the cozy bar that sits in the middle of the restaurant was an undiscovered gem for pre-dinner cocktails. Reservations are not accepted, but we had no trouble at all just walking in and getting a table. The breakfast menu offers a terrific selection of yogurt, cereal (hot and cold), egg dishes, pancakes, waffles and the occasionally exotic, such as lamb chops. Typically, The Restaurant is not open for lunch. Dinner consists of the day's specials, a regional tasting menu and everyday options. The food is always inventive, fresh and sometimes unexpected. Vegetarian, heart-healthy and sugar-free dishes are marked with special symbols. Food allergies can be accommodated; just advise your waiter, or let the line know ahead of time. Daily specials might include shrimp and crab souffle, green apple and cucumber salad, sauteed Chilean sea bass, vegetable & Israeli couscous strudel, parsley crusted calf liver, grilled ribeye steak, peanut crusted chicken breast and filet mignon, among many others. The regional tasting menu is a particular favorite for many diners. In Barcelona, for example, the menu consisted of a tapas platter as the starter, a Catalonian seafood paella as the entree and crema Catalana for dessert. Always-available menu items include tiger prawns, Caesar salad, New York strip steak, poached Norwegian salmon, and roasted chicken. Always-available side dishes are steamed vegetables, green beans, baked or mashed potatoes, creamed spinach and rice pilaf. You can also splash out on a spot of caviar (at market price). A cheese selection, creme brulee and New York cheesecake are always available for dessert. Other dessert offerings change daily. You can pick and choose what you want from any of the three sections of the menu. Portions are just right -- not too ample -- and, of course, you can order more if you're feeling peckish. The Chef's Table (Deck 1): An ambitious concept, the Chef's Table restaurant features a set menu, paired with wine that hews to one of five themes, each of which rotates every three days. The themes include Asian Panorama, Venice Carnival, La Route des Indes, which celebrates dishes with Indian spices, "sweet and salty" and "a gastronomic journey through time." Meant to be a leisurely evening at the table, the dinner offers five courses, including an amuse bouche and a palate cleanser. Wines are an integral part of the experience, and pairings can be unusual, such as a rose with oxtail soup. Courses are perfectly sized so that diners aren't over-stuffed. Accommodations can be made for special dietary requests. The Chef's Table is open from 6 p.m. to 9 p.m., and reservations are recommended. Themes revolve regularly so passengers can try a number of different menus on one cruise. Variety, selection and themed menus to The Chef's Table evolve regularly. Manfredi's (Deck 1): A break-out hit on Viking Star, Manfredi's is one of the best Italian restaurants at sea. It's got terrific atmosphere, with an open kitchen at the back where chefs prepare a delectable antipasto. By all means, come with an appetite. Everything -- from the crisply fried calamari with a balsamic dipping sauce, osso bucco and seabass to bistecca fiorentina and veal scallopini -- is consistently superb. The pasta and risotto options are also wonderful, and the daily special never fails to wow. Save room for dessert; the tiramisu is perfection, and the Nutella panna cotta is one of the best sweets we've had anywhere. Manfredi's is open daily from 6 p.m. to 9 p.m. Make your reservations early (even before sailing if you can); it books up fast. The Kitchen Table (Deck 1); $199 per person: Part shore excursion, part hands-on cooking experience, The Kitchen Table is the only extra-fee restaurant onboard Viking Star. It's housed in a beautiful test kitchen-like room tucked behind Chef's Table and Manfredi's, and it's only available once or twice per cruise. To start, passengers go ashore in the morning with a chef to shop for ingredients in a local food market. At dinnertime, they head to The Kitchen Table, where, under the chef's tutelage, they help to prepare the meal. (The majority of the cooking is done in a kitchen next door.) They then dine on a multicourse extravaganza that's paired with special wines chosen by the head sommelier. It's worth noting that, although the Kitchen Table can cater to a maximum of 12 people, you won't get the hands on prep and cooking part of that experience at that size. (There simply isn't enough room for 12 knife-wielding passengers.) Smaller groups up to eight people (minimum number is six) will get the full experience, with cooking stations set up round the room and large TVs enabling everyone to follow the action. You even get your own apron, which you can keep as a souvenir. The whole experience is wonderful; not only do you eat great food, but you also learn about its provenance, preparation and ideal wine pairing. Plan to stay awhile, The Kitchen Table lasts a good three hours or so. Our advice: Skip the delicious looking bread basket; there's so much food coming, you'll want to save plenty of room. Viking Living Room (Deck 1): Tucked away in a corner of The Living Room (adjacent to the bar) is a small display case full of croissants, muffins, pastries and cookies in the morning and cookies, muffins and finger sandwiches through most of the rest of the day. The World Cafe (Deck 7): To describe this top-ship venue as a buffet won't do it justice. It's the only casual restaurant of its kind at sea with an open kitchen, and food is prepared fresh and not allowed to sit too long. It serves breakfast (6:30 a.m. to 9:30 a.m.), lunch (11:30 a.m. to 2:30 p.m.) and dinner (6 p.m. to 9 p.m.). Dinner menus typically mimick those of The Restaurant, though there are some unique-to-The World Cafe items. As in The Restaurant, the floor-to-ceiling windows in the World Cafe open up in good weather; tables outside are set up for alfresco dining. Food is consistently delicious; breakfast includes a made-to-order omelet station (and made to order eggs benedict) and plenty of baked goods, while lunch includes pizza and pasta made on the spot, a salad bar and a bagel sandwich of the day. You'll also find great joints of meat, lighter dishes like grilled fish, and staples like burgers and fries. You can help yourself from the buffet or request dishes made fresh from the cooking stations. At dinnertime, don't miss the sushi bar. At both lunch and the evening meal, the freshly made gelato earned raves. One minor complaint: Salad fixings are only available at lunchtime, and then only at the Pool Grill. There is no way to make a salad for dinner. The Pool Grill (Deck 7): An upmarket interpretation of a burger bar, The Pool Grill offers made-to-order burgers (vegetarian burgers, too), chicken sandwiches, grilled fish and the most delicious skinny French fries. The adjacent salad bar offers make-your-own and premade salad options. It's open from 11:30 a.m. to 5 p.m. daily. Wintergarden (Deck 7): Most afternoons between 4 p.m. and 5 p.m., the Wintergarden offers afternoon tea with scones, small cakes and sandwiches. Mamsen's (Deck 7): An unexpected treasure, this small food station, which Viking refers to as a "Norwegian Deli," offers sweet and savory treats from Viking President Torstein Hagen's mother's cookbook. Tucked away in the Explorer's Lounge, it serves a selection of open-faced and warm sandwiches, such as Atlantic shrimp on white bread, beef tartare on rye bread, cured salmon on dark bread, fish cakes on rye bread and liver pate on rye with bacon and fried mushrooms. A small selection of creamy pastries and pies are available, as well. And at midnight, don't forget to stop by for the split pea soup. But most of all, try Mamsen's fabulous waffles. They're hot off the griddle and topped with Norwegian cheeses and chocolate sauce, as well as an excellent array of fruits. Mamsen's is open for early-riser (6:30 a.m. to 7:30 a.m.) and late-riser (7:30 a.m. to 11 a.m.) breakfast. Lunch is served from 11:30 a.m. to 2 p.m., with snacks from 4 p.m. to 5 p.m. and late-night noshes from 10 p.m. to midnight. Room Service:In-cabin service is available around the clock. The menu is tantalizing, with items like Norwegian gravlax, chef salad, cheese plates, pasta with three sauce options (bolognaise, pesto and pomodoro), grilled salmon and chicken, and burgers. A full range of hot and cold breakfast items are available to all cabins; these include fresh fruit, pancakes, steel-cut oatmeal and eggs.